'Nuff with the sadness. I would just wanna share that this semester had been awesome for me 'cos I was able to enroll in a HydroAerobics class as my PE (Physical Education) subject. When I registered this class before the sem started, I had doubts and discouragements. I thought that by the end of the semester, I'll be so dark-skinned. It was kinda true. My skin darkened by about 9-10 shades. Sigh again. I was not able to hit my weight-loss target either. Actually I think I gained more in this sem. Haha. Total fail. But anyways, I enjoyed this sem because of that fun-filled PE class. I enjoyed our lunch-outs after the class. Those Lutong Bahay (LB) moments and ordering fruit shakes with our preferred lunches. I enjoyed the no-exam system that was not supposed to happen but it happened anyways because Ma'am Tal said she wanted the semester to be fun so she took away all the exams and replaced them with class activities every meeting. Having said that, I enjoyed this sem because of her, our HydroAero instructor - Ms. Natalia "Tal" Uy. She's one darn great instructor to have. Worth recommending to those who still have PE courses to take. I enjoyed it 'cos I was able to improve my swimming skills a little. 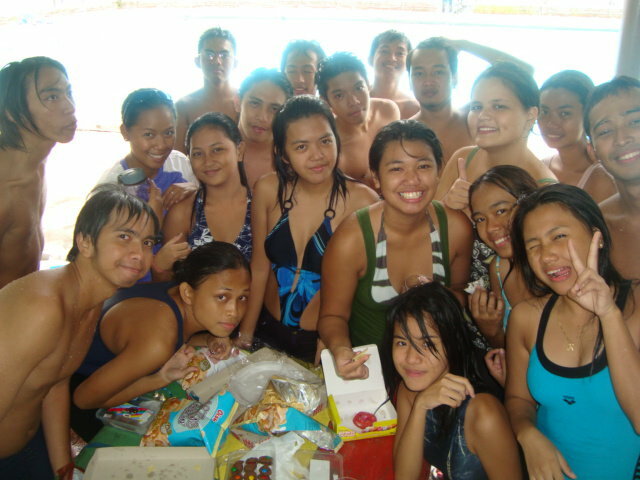 Ma'am Tal allowed us to have some free swimtime after our class. And since my PE class ends 11am and my next period comes at 1pm, I had some pretty long minutes to spare for free swim. I loved it. I love how I was able to appreciate the littlest things about this class. And that made me enjoy every single bit of it.